I think as of yesterday Amazon finally has the books and has begun shipping. This also means you can now review the book. So once you read it, I'd really appreciate a review over there! I'd really like to hear from people all over the country. Tell us when you spot or buy the book in Borders, Barnes & Noble, Books a Million, Waldenbooks, etc. and all the very fine independent bookstores out there. It really should be showing up very soon if not already. Word count update: THE MAZE RUNNER sequel: 15,089 words. THE 13TH REALITY BOOK 3: 51,146 words. 1. Been having a blast in St. George, my first stop in promoting Book 2 of THE 13TH REALITY. I visited 6 schools and they were all great crowds. They laughed at my jokes, which is always a relief. Of course, it's not that hard to make elementary kids laugh. Just say poopoo if you get desperate. 2. The signing went well last night, and thanks to Paul the manager at the store. And a big thanks to all the kids and their parents who came out. I always forget how mentally draining it can be to give each kid his memorable experience, even if it only lasts for 20 seconds or so. I'm usually a zombie by the time I go home. 3. I'm very sorry for the mass confusion I caused by telling everyone the book was released this week. Honestly, I think I misunderstood. Since I didn't really have a hard street date, I think it only made it to local and independent stores this week because they can process it more quickly. The big chains like Barnes and Noble and Borders and Amazon probably won't have it until next week. I'm sorry! 4. Thanks to everyone who pimped my books recently. We'll have to wait and see if I get to reward you with an advance copy of THE MAZE RUNNER. 5. Wow, I love all the witty banter in the comments! It gives me great joy to know that I have so many psychos (yes, that's a compliment) following my blog. Great joy indeed. Keep it up. 6. I've been invited to join Brandon Sanderson's and Dan Well's forum community, with a section all to myself for fans to talk about anything and everything James Dashner. I'm struggling to decide if we're ready for this. Nothing would be worse than to have a forum that was lame because we didn't have enough people participating. And I don't want to kill the great momentum this blog has gained in the last months. So, I'm asking your opinions. Should we start a forum? Would you participate? Be honest! There could be threads for all my books, upcoming books, plot discussions, writer questions, movie and book talk, etc. What do you think? I'm thinking we might want to wait until MAZE comes out. 7. I ate ribs last night. I wish I hadn't eaten ribs last night. 8. If I see one more book review that says "tour de force" I'm going to shoot someone in the foot. What in the name of all that is good and green on this earth does "tour de force" even mean? Seriously. Can't you just say, whoa, dude, this book is wicked awesome? A. The main character running the faucet to splash water on their face, then they stare deeply into their own eyes in the mirror, contemplating. Who actually does this? B. People shouting, "What do you want from me!" Can you say overdone? C. Particular to action movies: the main character walking toward us in slow motion while something explodes behind them. Can you say overdone? 10. Well, I got awfully snooty, didn't I? If you're a Hollywood producer or director who may be kind enough to be looking at my book, please know that I would donate my own vital organs to science to have any one of those three things above in a movie based on a book by James Dashner. I would even donate them to you, good sir or madam. May I ask, do you happen to need any vital organs? I'm your man. Well, I believe it's official. THE 13TH REALITY: THE HUNT FOR DARK INFINITY is officially released. We sold out on Saturday and I'm going off to promote it, so I think that means it's so. I hope a lot of you are excited to go read it! It's hard to believe that an entire year has passed since I first went on the Change the World Tour. It took me from Virginia to Atlanta to California. Part 2 last fall saw me go to New Hampshire, Boston, South Carolina, Texas, and San Francisco. With lots of Arizona, Idaho, and Utah mixed in. For the release of Book 2, we're scaling back a lot. I'll be spending the next 3 or 4 weeks visiting schools and doing signings in Utah and Arizona. Then we're putting a moratorium on visits for awhile because I have 3 books to write in the next 12 months! This week I'm in the St. George (Tues, 6:30, Deseret Book) and Logan (Fri, 6:30, Deseret Book) areas. Come see me!!! Next week is Orem then off to Arizona. I had such an awesome time at LTUE at BYU this past weekend. It was by far the best one yet, with hundreds of attendees and an unbelievable slate of authors (Tracy and Laura Hickman, Brandon Sanderson, Dan Wells, Brandon Mull, Jessica Day George, L.E. Modessitt Jr., David Farland, Aprilynne Pike, Julie Wright, and many others). I met many aspiring writers and had good times talking to them (including some rather psychotic folks from the Eagle Mountain area). I also did a reading of the first 2 chapters of THE MAZE RUNNER, which I was very nervous about. But it seemed to go over well. I hate to admit this because of my image as a big tough biker type, and I'm pretty sure no one noticed, but I almost choked up a couple of times reading it. I guess it was just because I've had so much heartache and ups and downs seeing that book finally find a life that it got to me. I hope it's all been worth it when you finally read the thing. Okay, I spend so much time shamelessly bragging about myself on here, I want to share an unbelievable announcement for my friend Aprilynne Pike. Her book, WINGS, coming from Harper Teen on May 5th, is going to have a first print run of 200,000 copies!!!!!! That is AMAZING. She's going to be a big, big name, and I'm very excited for her. Well, I hope everyone watched the Oscars. Actually, I'm watching it right now. Whoa, Kate Winslet just won her first one! Sweet. Won't that be cool when THE MAZE RUNNER wins Best Adapted Screenplay? And THE 13TH REALITY wins Best Picture? And I win Best Actor? Have a great week, and I hope to see some of you during the tour. Later. Wow, just a few days after my first appearance ever in PW, today THE MAZE RUNNER is in the title of one of the featured articles! CLICK HERE to see it on the main page. If it's not there by the time you look, here's the link to the actual article: CLICK HERE. Don't get too excited. This doesn't mean anything. Yet. Keep those fingers crossed. EDIT: By the way, the description of the book in the article has a couple of minor... misunderstandings. Mainly this: it's not set in an alternate reality. Maybe they confused it with my other books! :-) Of course, it is fiction, so in that way maybe it's an alternate reality. I don't know. But Lost meets Pan's Labyrinth? I LOVE that! Looks like my easy-peasy giveaway might not be so easy-peasy. I mean, I'm pretty confident I will get some ARCs, but my agent told me to hold off on doing anything official because Random House will be keeping close tabs on publicity for this book and I need to wait before I go all nuts and start making promises. So, I don't really know what to do but wait and see a bit. If you do something to promote my book/series next week, I will do something for you. How's that? Dumb? Yes. Ridiculous? Yes. Vague? Uh, yes. But it's the best I can do. No, listen. I'm sure I'll get some ARCs. And those of you who promote 13th for me will get top priority. I must say, LexiconLuvr and LouMac have already set the bar pretty high! Remember that I will be at BYU this Thursday through Friday for the LTUE conference, with the very first signing of Book 2 on Saturday at 2:00 in the BYU Bookstore. For the schedule of panels and such, CLICK HERE. Next Tuesday (Feb 24th) I'll have a signing at the Deseret Bookstore in St. George UT. On Friday the 27th, I'll be at the Logan UT Deseret Bookstore. I think both are at 7:00. Then Tuesday March 3 I'll be at the Orem UT Barnes and Noble. From there I got to Arizona for a week and a half and don't quite know the schedule yet. All this should be updated soon over at www.The13thReality.com. Looky there. For the first time ever, my name is in Publisher's Weekly! CLICK HERE then scroll down to the Random House/Delacorte section. Cool. I'll post rules tomorrow on the advance copy giveaway. It's a deal: Books 2 and 3 of THE MAZE RUNNER trilogy have sold to Krista Marino at Delacorte (a division of Random House Children's) by Michael Bourret at Dystel & Goderich, for release in Fall of 2010 and 2011. Does that sound official enough? I wrote that on my own, ya know. I'm beyond excited, and won't make a fool of myself by trying to express that. I think you can guess very well how I'm feeling. This was my (hopeful) plan from the beginning, so it's not like I just pulled 2 sequels out of the air. Each book will be very enjoyable as stand alones, but you will definitely want to read all of them. It tells quite the story! A couple of interesting sidenotes: Barnes and Noble and Amazon gave them feeback on the cover they'd come up with, and they all mutually agreed to go a different direction. So the ARCs and the catalog may just have a black cover with white lettering since those are about ready to go to press. I've been assured this is actually kinda cool and mysterious. I have every confidence that the eventual cover will be awesome. Also, I shouldn't even say this, but it looks like they are upping the release date!!! MAYBE. It was scheduled for December this year but may come out in late September. Keep your fingers crossed. The only slightly scary part of all this: I'm going to be one busy dude. My deadline for Book 2 is July 1st of this year (We sold it based on a 4 page outline). I also have to finish 13th Reality 3 by then. And, of course, I have a book coming out in a week and a half with lots of stuff planned to promote it. And several writer's conferences and other events. Am I complaining? Absolutely not! These next few months are going to be exactly what I've always dreamed of: the busy life of an author. I hope you guys will stick with me and enjoy the ride! 1. I think my payment on the email address I've always used for fan mail has run out. I can't login and I can't figure out how to contact the people. Plus, I don't want to. I never liked their system. So please discontinue emailing the address I had set up along the sidebar of the blog. It was author at (ya know, @) jamesdashner dot (ya know, ".") com. I'll set up a new one very soon and get it on the sidebar. Meanwhile, don't email the old one, and if you have in the last day or so, I might not have gotten it. 2. I know you guys hate when I do this, but I just found out some very good news that I can't tell you yet. Anyone who follows this blog has already probably guessed what it is. Here's a hint: THE MAZE RUNNER sold to Random House as a one-book deal. I've always meant it to be a trilogy. So, my Grandpa's name was Edgar Thomas Player. And, like most Grandpas, he was wicked awesome (that's for my Boston fans). This is why I used the name Edgar for Tick's dad in THE 13TH REALITY. Well, recently I committed to expand my reading choices to books I might not be inclined to run over old ladies to buy. Pretty sure I'd never read an Oprah book in my life, so I borrowed THE STORY OF EDGAR SAWTELLE from my mother-in-law. Big thick book, attractive cover, selling like hot cakes. Not knowing a thing about it, I dug in. Now, you won't believe this, but the main character's name is Edgar. I kinda knew that going in. But then I finished it (I'll give my opinion in a sec) and moved on to my next book, also not knowing anything about it. (Remember, I do this with both movies and books as much as humanly possible.) It was DUMA KEY, by my favorite author, Stephen King. I'd been holding out on that one as a reward, and finally couldn't wait any longer. Guess what the main character's name is? Edgar. What are the odds of this? Two books in a row with the main dude named Edgar. Plus, it makes my choice of the name not so original anymore. Anyway, just for the record, MY book came out before both of these, so there. At least, I think it did. Did you know EDGAR SAWTELLE is a modern telling of Hamlet? I'm so glad I found this out because it made the book much more fascinating. The author does it in very clever ways, but it's also obvious. And if you like dogs, this is a must read for you. It's long, and very literary, and pretty much depressing (hello, based on Hamlet), but really good. A masterpiece in character development. I read the last 200 pages in one day, and them's a lotta words on each page! I can promise you this: when it's over, you will feel like Edgar is a real person and you will love him like a brother or son. Excellent job, Mr. David Wroblewski. Excellent lessons for any writer - I learned a lot. Haven't finished DUMA KEY yet, but so far so good. I also read HUNGER GAMES by Suzanne Collins recently. Definitely one of those books you could possibly read in one sitting if you had a few hours to kill. I think the reason I liked it so much is because it's exactly the kind of book I try to write for people, and its audience will be the same audience for MAZE. So I hope my timing is good, because that book is hot, hot, hot right now. To be honest, I was scared to read it. I'd heard so much about it from so many people, I thought I'd start it and get depressed because it was a billion times better than MAZE. But you know what, it didn't do that! Instead, it gave me 100% confidence that anyone who likes that book will also like MAZE. Wow, miracles never cease. Anyway, as you can see, I don't tell you much when I do reviews. Just the way I like them. Don't forget to come see me if you live in Utah at the LTUE conference at BYU. CLICK HERE. And here's a writing update on Book 3 of 13TH REALITY: 49,148 words. Whoa, we're getting really close to the release of Book 2. I feel like this has totally snuck up on me, and I haven't done as much thinking about promoting the release as I did with Book 1. I think part of that is because my publisher has really pulled back due to the economy and my release tour is going to be very modest. But, hey! Stupid Dashner! That means you should be working even harder to promote it on the Internet! Meanwhile, I really hurt my knee last Thursday night playing basketball. Yes, pity me. I was making a very Jordanesque drive to the hoop when I planted my right leg awkwardly and I felt something twist and turn inside my kneecap. Never had that happen before. It was very strange and very painful. Of course, I fell to the floor and writhed in agony, realizing the opportunity of a lifetime to be treated like a king. Carried off the floor, brought my own personal bag of ice, many looks of concern for my welfare. And I've milked it at home, too, enjoying the royal treatment from my wife and kids. Even my one-year-old brought me my copy of Entertainment Weekly when he could tell I needed a boost. I spoke with my Physical Therapist friend and he told me to wait until today to see if I should go to the doctor. It's better, but not a whole lot better. I'm currently trying to decide what to do. I didn't feel the infamous "POP" so I'm really hoping it's nothing serious. Okay, just had an idea. It seems like a lot of you are really excited for my book, THE MAZE RUNNER. Well, we should be seeing advance copies for that sometime in May. Now, I have no idea how many of those I'll be receiving, but hopefully enough to make this worthwhile. How about one of those blog tour thingies? Do those work? Every person who blogs about my book the week of its release will have their name put into the drawing hat. If I get enough ARCs for everyone, a copy is yours when they are printed. If there aren't enough, we'll give away as many as I get until they run out, drawing names randomly. Does that sound like it'll help? I'm asking for advice from my faithful readers. I want to do something that will really help get the word out. Book 1 was well received, and almost all of the reviews were very positive. But Book 2 is so much better, and I want people to discover it! Any ideas or thoughts would be appreciated. I now officially know where the first opportunity to buy my book and have me sign it will be. The BYU Bookstore will have copies of Book 2 when I'm there for LTUE, the writing/ scifi/ fantasy/ educator symposium to be held the weekend of February 19-21. My signing will be at the bookstore at 2:00 pm on Saturday the 21st, and Book 2 will be there, even though it's technically early. I'll also be doing a reading and various panels that whole event, so be sure and check out the website for the schedule. It's free. No, really, it's free! And lots of big names will be there. To check it out, CLICK HERE. Anyway, I hope we can have a party atmosphere around here at The Dashner Dude as we countdown to the release of THE HUNT FOR DARK INFINITY. And any help or advice you guys can give me, bring it on, please! Let's make this thing rock n roll. Yesterday, I had jury duty. I've always loved courtroomy, lawyerly, trially stuff. Love a good John Grisham book. My wife and I used to watch The Practice faithfully every week. Some of my favorite movie moments range from Jack Nicholson saying, "You can't handle the truth!" in A Few Good Men to the dude who plays Kramer telling a juror when he asks her name, "And may I remind you, you are under oath!" in Trial and Error. And so it only made sense that I've always, always, always wanted to be called to jury duty. I mean, come on, that's half the reason I'm registered to vote! And yet, here I was, little sad James, having been eighteen since 1990 and never getting that vital piece of mail. Until a few weeks ago. Yes, it came. A green piece of cardstock, offically naming me juror for the United States of America. I was to call a special telephone number on an encrypted line meant only for me on the eve of January 30th to get my top secret instructions. I put the sacred paper in my planner, marked the date, began to prepare myself by watching reruns of Perry Mason, Matlock and Murder, She Wrote. 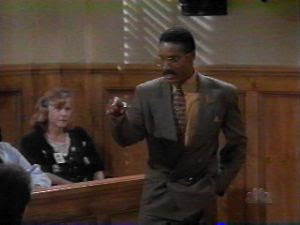 "Maybe I'll stand up in the middle of a witness's testimony and yell, 'I hereby declare this a mistrial!' and then just tell 'em I was joshin' around, keep going." "No matter what everyone else on the jury thinks, I'm gonna take the opposite opinion so we can drag the trial out and get on the news and make headlines all over the world and then I'll let it slip that I happen to be an author and we'll get all kinds of free publicity and then they'll have to call in an alternate for me because I'll be so famous and we'll buy a mountain in Colorado and build a JK Rowling/Enya castle on it." "I hope they call me as the foreman. I think I'll use a British accent to help my chances." You get the idea. Yes, I was excited. Yes, I thought through every little thing to make sure I got selected from the jury pool to actually serve on the jury. Yes, I hoped for a really big case. Yes, I'm an idiot. The day came. January 30th. I was to call the secret number after 5:00 pm Mountain Standard Time. The world was ready for James Dashner, Juror Number 34264. Yeah, I forgot to call. HOLY CRAP! I forgot to call the freaking telephone number! It says right here on the letter that I will be sent to jail for 30 days and be forced to pay a fine of one thousand US Dollars. Not to mention the fact I may have lost my one chance in life to stand up and say, "Your Honor, we find the defendant..." then pause for a very long time and look around the room and make lots of dramatic faces before saying, "Guilty as charged! Buuuuuuuuuurn her!" I call the number. Yes, I was supposed to report. I leave a message, profusely apologizing and begging them not to send me to jail. I drive downtown to the courthouse. It's noon, people. I was supposed to be there at 8:30. I'm scared. The lady in charge looks at me like I'm an idiot. "Come on Wednesday," she says. Whew, no jail. I'm spared having to bunk up with Jack the Ripper, eating that grey mush on toast, and scratching lines for each day on the wall with my fingernails. So I went yesterday, reporting 35 minutes early. The lady wasn't impressed and told me to go in the big room with everyone else and sit down. I did. Here's the great part: Despite being on the verge of having my name called and becoming perhaps the most important person to serve the halls of justice in a hundred years, I whipped out my laptop anyway and completed 1,000 words on Book 3 of The 13th Reality while I waited. Talk about multi-tasking under duress. Bailiff Snow finally came and called my name along with 20 or so other people. I went into the courtroom. The case was underage drinking and assaulting a police officer by a girl who looked like she was about ten years old. We were told it would be a one day trial. My heart sank. No murders, no decapitations, no armed robberies of banks. Instead, underage drinking. A girl slapping a cop on the shoulder. Dang. In the end, I didn't even get chosen to be one of the six jurors. I was out of the courtroom and eating sushi in self-pity by noon. Can you say anti-climactic? 1. Sunbum asked when my 13th Reality Book 2 comes out. Well, actually, very timely question because the release date has been moved up a week! Kinda sorta. It's more of a matter that I don't really have a hard street date, and the books are all in, and we scheduled some school visits the last week of February, and yada yada yada, the book will be in most stores starting the week of February 23rd. Wow, that's 3 weeks from today. 3 weeks! How did that happen? 2. Mr. Vincent asked whether or not my books will be released in the UK. Great question. First, THE MAZE RUNNER. Very good chance. My agency started offering it to foreign rights agents once it was sent to copyediting, and the word I've received is that interest is very high. Hopefully we'll see some things happen on that front in the next few months. Second, 13TH REALITY. No idea. I think the Simon & Schuster paperback deal will help, because I believe that also includes foreign rights, and they probably have a lot more clout shopping it around. But it might be awhile. Sorry! LTUE at BYU on February 19th-21st. This one is FREE and I'll be on many panels and readings and signings and stuff. SCBWI conference in St. George Utah on March 21st. Storymakers Conference in Provo UT on April 24th and 25th. Conduit in Salt Lake City UT on May 22nd-23rd. 4. Ron Simpson asked if I'm going on tour for Book 2's release. Yes. It's kind of scaled back because of the economy, but I'll be doing lots of stuff in Arizona, Utah, and one other state we haven't decided on yet. 5. LexiconLuvr (excited to meet you at the BYU thing!) asked what my duties would be as literary chair for the arts foundation. Basically, they have 2 retreats a year where artists from different disciplines (literature, visual arts, film, music, theater) go to Aspen Grove in the mountains and share their work, have awesome discussions on our places in the world, and eat lots of food. As chair, I help out and lead discussions and decide who comes from my discipline. 6. LexiconLuvr also asked how many presentations/workshops I do a year and what's the experience like. Well, I do as many as I can, probably an average of one thing a month. Krista (at Random House) has told me they push their authors really hard on things like that, so I hope my national opportunities really pick up once MAZE comes out. As for what it's like, I LOVE it. It's probably the Number One Thing of my author career. I love going to writer's conferences and chillin' with people of my own species. The only humans who understand writers, truly, are other writers, which is why it's so fun. 7. Macotar asked if I'll ever miss my old job of accounting. Which made me laugh for about three hours and seven minutes. 8. LouMac pointed out that I was able to refrain from doing ten items last week. You see, I'm not as OCD as we thought. And looky there, I'm stopping early today, too. Sometimes I amaze even myself. 9. Loumac also asked who Sally is. And used the word "her." Which is strange. I'll say no more. 10. Darn you LouMac! Look what you've done! You made me get so close to ten I couldn't resist. Oh the horror.